Just how much can you save at the grocery store with coupons? If you’ve ever watched the reality TV show Extreme Couponing, you know that it’s quite possible to pay just $100, and walk out with a cart full. But that’s in the States—up here in Canada, sadly, your coupons won’t go nearly as far. In the U.S., there’s much more competition between grocery stores, so retailers offer a host of promotional strategies that stores in Canada don’t use. These include Catalina Coupons, which print out with your receipt and will be honoured by several grocery stores (they can even be combined for added savings), coupon stacking (using two separate coupons for one item) and double coupons (when a store takes your coupon and doubles the value). In Canada, the best approach is to find a store that has the item you’re looking for on sale, then lower the price further by using a coupon. Be strategic. Hold on to high-value coupons and use them only when the item is already on sale. 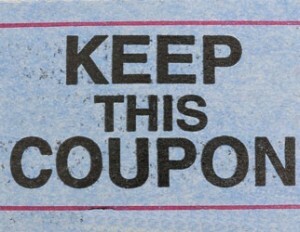 You can also print coupons from websites like Redflagdeals.com, Save.ca, Smartcanucks.ca and Websaver.ca. But first, make sure you know the coupon policy of individual stores—some accept printed coupons, and some don’t. For even more savings, Cassie Howard, who runs the coupon website Mrsjanuary.com, suggests contacting companies and asking them to send you coupons. Some good ones to try include Johnson & Johnson, Chapman’s, Dole, Tetley, Kellogg’s and Procter and Gamble. “Most will send you coupons if you email and ask,” she says.